A gentle incline which leads you from the street to the bar is a delightful entrance on a darkened winters evening. The bar area is small, however service has always been swift. There is a good range of seating in separate areas to the left and right of the entrance walk. In the summer months try and grab the much sort after balcony seats, there are only a couple perched up from the street so you will need to be lucky. There is a good selection of Ales and they have been very well kepts on all of my visits. 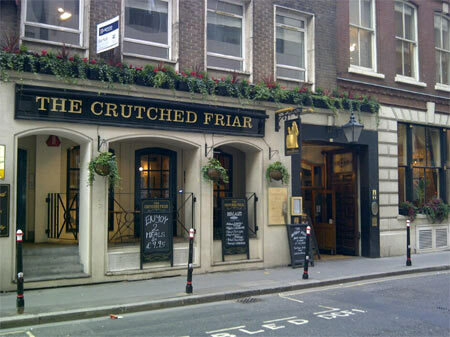 Between The Crutched Friar and the Cheshire Cheese just off Crutched Friars runs a little-known thoroughfare, French Ordinary Court, half covered by Fenchchurch Street railway and to this day the very ground and walls are permeated by a strong sweet smell, its origin is a mystery. Pepys mentioned Crutched Friars on Wednesday 6th May 1668 "I did walk in the dusk up and down, round through our garden, over Tower Hill, and so through Crutched Friars". Just to the east and under the railway bridge on Crosswall street you will find One America Square, during it's construction in the 1980's a 100ft section of Roman City Wall was found. The Wall is set in the basement and is party visible through a glass panel.